﻿I have a dirty little secret. But before I tell you what it is, here is the thing…I get burnt out on cooking some nights. As much as I love trying to come up with interesting new things to eat for dinner, there are days when I have no inspiration. Or maybe it was a crazy stressful day and all I really want is a margarita. Either way, there are nights were I will eat frozen burritos for dinner. Brent and I try to keep some frozen items stocked up for when we want a quick snack or lunch on the weekend. We try and mix it up most of the time, but recently Brent has developed a deep love for the frozen burrito, so they are almost always on hand. They are usually his “second dinner”. That is if he isn’t having a late night bowl of ice cream. Side note: How is it that boys can eat whatever they want and not gain a pound? I swear if I had his eating habits, I’d double in size in less than a month. Back to burritos! So this past weekend we ran out, and Brent asked me to put them on the grocery list. Instead, I decided that it was time to make them at home and see how it goes. My personal belief is that anything you make at home will be healthier, and better for you, than what you may get in a restaurant or buying it pre-made. This does not mean by any means that I won’t get down with that stuff every so often; I just try to keep it to a minimum. To me, it’s all about balance and moderation. I’m happy to say that I think these worked out perfectly. They froze fine and heated up without a problem. And they tasted pretty good too! My favorite thing to do when I have a frozen burrito (or two) for dinner is to load it up with fresh veggies on top. After I heat them up and melt some cheese on top, I chop up whatever produce I happen to have on hand and toss it on. Add a little sour cream, salsa or my favorite Cholula and it’s ready to be devoured. 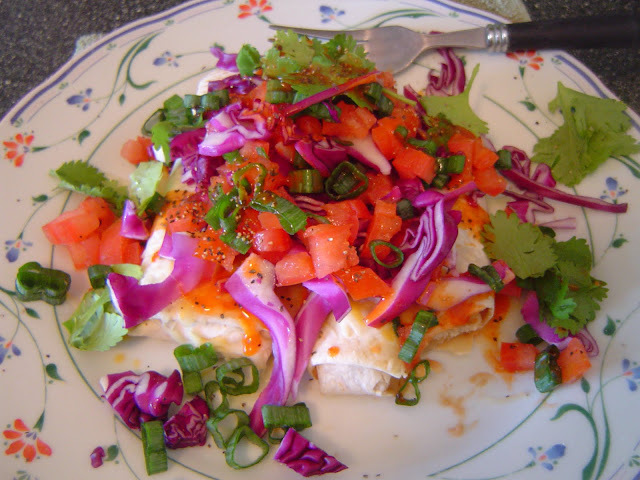 In this picture, I used radicchio, tomatoes, cilantro, scallions and Cholula. I’ve also topped them with mixed greens, spinach, arugula, red onions, and avocados to name a few. I will say that adding the veggies make me feel a little less guilty, and actually make it a more satisfying meal. And it’s ready in no time, so that is a definite plus on a busy or exhausting night! *You could also just use a taco seasoning packet if you have one handy. 1. Brown your ground beef in a large sauté pan over medium high heat until fully cooked. Drain off grease and return to pan. 2. Add water, beans, and seasonings to beef and simmer on low for 15 minutes, covered. Stir occasionally. 3. After 15 minutes, remove lid, add salsa and simmer an additional 10 minutes or until nearly all excess liquid is gone. Turn off heat and allow to cool. 4. After mixture has cooled enough to handle, heat a few tortillas up in the microwave for 15 seconds to help with flexibility. Spoon roughly 3 or 4 tablespoons of the mixture into the center length of the tortilla and top with a small amount of cheese. Fold the short sides in and then roll up. Repeat until done. 5. Lay burritos flat on a baking sheet and allow to freeze. Once frozen, place burritos in a freezer ziplock bag and store. If you think you won’t be eating them relatively soon, you can wrap individually with saran wrap before placing in the bag. Just remember to remove it before tossing into the microwave. 6. To reheat, place in the microwave for 2-3 minutes for one burrito. Add an additional 1-2 minutes for additional burritos. And don’t forget to add your veggies! Not only to they make the burritos more filling, they look prettier too. My whole family loves burritos. I've frozen them in the past, but now that there are several of us eating them, it's just as easy to freeze the filling, warm that up and assemble when we are ready to eat. Either way works great and you are right, it's always better made at home! @Barefeet - I love that idea! @ Natalie - I think the beans make them more filling. Next time I might use refried so see if that makes them creamier. This looks great! I've been trying to stock my freezer and I'll definitely be trying this one!